Bette Davis once said “old age is no place for sissies,” and she was right. When mobility becomes an issue, even something as simple as a shower or bath becomes a challenge, and requires a certain amount of bravery to attempt. Well, we can’t get rid of geriatric aches and pains, but we can help out our senior and disabled customers by outfitting handicapped shower stalls and tubs with high quality curtain tracks and curtains. The first thing we can do is make it quick and easy to install a sturdy, quality shower curtain track with our popular do-it-yourself shower curtain kit. These inexpensive kits come with the curtain track, brackets, screws, end stops, and wheel carriers included. In other words, we provide everything you need except the screws and the curtain; but if you’d like us to provide the curtain, we can do that, too. 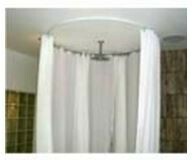 Our Aquaguard Shower Curtains (available in blue, champagne, or white) are sturdy curtains that can be used as a liner or stand-alone panel. They are thick and durable to the point that they won’t billow, making them easy to grab, and better than thinner curtains for keeping showers private. If visibility is an issue, an opaque curtain might make the shower area too dark to be safe. In this case, double polished clear curtains are a better choice. These custom-sized shower curtains work well for letting in light, and also for allowing caregivers to monitor progress if needed. If you have a custom-made shower stall that is designed for ease of entry/exit, a standard track or rod might not be flexible enough to cover the area sufficiently. In this case, the 6100 Flexible Curtain Track, which can be bent easily by hand into curved and angled shapes, is the way to go. This track can be mounted in the ceiling and used with either of the curtains described above. If you are trying to equip a handicapped shower stall or tub, we can help. Please call us at 888-434-7444 so we can assist you.